Welcome to CFO.University’s transcript of Grant Jones’ CFO EdTalk Without Change, the M&A Boom Will Stunt Economic Growth. Grant highlights studies that show M&A is a statistical failure. But he gives us hope with three ideas on how to improve the rationale for doing acquisitions, as well as improved success rates. ​I liken mergers and acquisitions to terminal illnesses. We all either know somebody or have ourselves been impacted by a terminal illness and our outlook has been quite negative. I blame this negative outlook on the famous quote by Albert Einstein that goes “We keep doing the same thing over and over again, expecting different results”. This is also known as the definition of insanity. 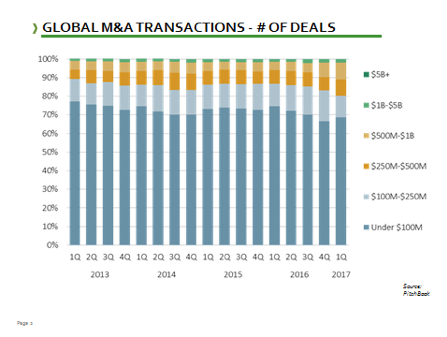 To give some scope to the problem, we’re actually coming out of record M&A activity. From 2010 through 2017 we’ve had 67,094 reported transactions. This led to $6.55 trillion exchanging hands. Well, it’s all the big deals that get the big headlines. 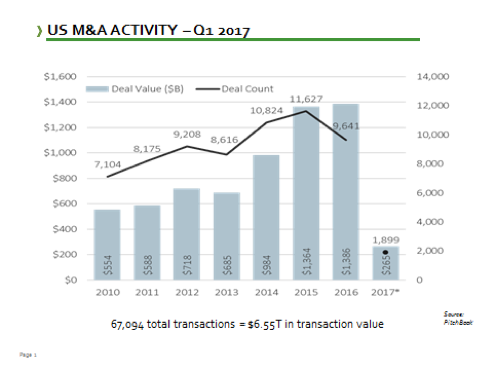 According to PitchBook, roughly 70% of all deals done around the globe are less than $100 million in transaction value. This means the overwhelming majority of transactions are actually your local, family-owned or privately held businesses. There were some substantial economic benefits. First and foremost, this created substantial liquidity for the exiting owners to move on with life, or simply move on to retirement. Coupled with this was the acceleration of the entrepreneurial cycle. These exiting owners went off and created new ideas or new businesses. There was also a huge lift to the financial and banking sector. As we came out of the Great Recession, the banking sector was crippled. To do $6.55 trillion in acquisitions means we had to go out and borrow substantial amounts of money. This was a great lifeline for the banking sectors as we came out of the recession. ​If you were to go Google M&A success rates, you would get a different story. M&A is a complete statistical failure. Regardless of your source, Forbes, McKinsey, Harvard Business Review, they would all argue that M&A fails over 50% of the time. Now, failure is somewhat in the eye of the beholder. But, across the board, all these would define success or failure as not accomplishing the goal that they set out with when they moved forward with an acquisition. Now, if we were to do some basic math, if we spent $6.55 trillion on acquisitions, that means we wasted $3 to $4 trillion on acquisitions. It could at least be argued that there was a huge opportunity cost for what could have been. Now since 2010, we’ve had some real doozies. In 2011, Google acquired Motorola for $12.5 billion. Two years later they sold it off for $2.81 billion, almost a $10 billion economic waste. Then again, in 2014, Microsoft acquired Nokia for $7.9 billion. Just one year later, they wrote off almost the entire amount. Apparently, it was a tough time to be buying cell phone companies. However, most experts would say the worst deal in history was in 2011 when Hewlett Packard acquired a company called Autonomy for $11.7 billion. One year later, they wrote off $8.8 billion to eventually sell off the pieces in 2016 for $170 million dollars. This was roughly an $11.5 billion economic waste. Now, some would argue that there’s residual value to these acquisitions. And I would agree. However these write-offs aren’t without consequences. No question, there was substantial job loss as well as loss of shareholder value. But, so what? Why does this matter? 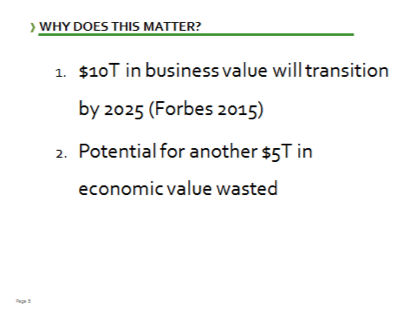 Forbes estimates that between 2015- 2025 there will be $10 trillion of business value transition. This means in 10 years, $10 trillion of business value will find new ownership. If these success rates hold true, we have the potential for $5 trillion of more economic waste. Now, if you were to go back to that original Google search and ask, why does M&A fail? You’re going to get all the same sources to tell you all the same reasons. I’m going to summarize these into two categories. ​The first one being poor integration. This includes topics like a cultural mismatch, missing key leadership roles or not keeping talent. This also includes lack of a solid due diligence process; where the skeletons reveal themselves after the acquisition or even the ego of the acquirer getting in the way, “ It’s going to be our way or the highway”. 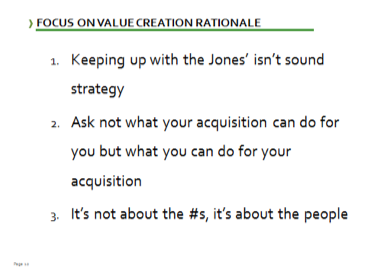 ​Then there’s acquisition rationale. This is not having a strong selection process or what’s deemed poor strategic fit. Often times, this means there was an overestimate of synergies, frequently a financial model including cost cutting that can’t be realized. And then there’s this grand revenue scheme where one plus one’s going equal five and they end up falling short. You could also simply have poor deal terms or just overpaid which leads to poor decision as desperation rules the day? While I would argue integration is important, if you didn’t have a strong rationale for why you did the acquisition in the first place, it’s going to fail. ​So, here are three ideas that will help improve our value creation rationale and improve our success rate. ​1. The first one I title “Keeping up with the Joneses is not a sound strategy”. Much like in the analogy, when you see all your neighbors buying new toys, companies are going out and saying, well, we must grow through acquisition too or we risk falling behind. This is a terrible strategy for growth. Additionally, there are substantial economic pressures to grow through acquisition. We’ve been in the slow growth economy for a period of time now, and it’s quite frankly, not suitable for shareholders. So key executives look around and say, “Well, if we can’t grow organically fast enough, then we must grow through acquisition”; regardless if it’s our core competency to do so. Many companies don’t have the competency to run a selection process, negotiate a good deal, and then find the synergies to be successful. 2. Secondly, on a twist of a famous JFK quote, “Ask not what the acquisition can do for you, but what you can do for the acquisition”. Too often companies go into their strategic planning meetings, and they sit around, and their conversations go something like this. You know, we really should grow our geographic reach. “Do we know anybody in that territory we can go buy?” or “You know we really want to expand our product line”. Who do we know that we can go acquire to help us grow? This me, me, me, attitude actually jeopardizes the opportunity to be successful. The companies that are most successful with acquisitions actually focus on “What is the acquiring company doing well?” and “How can we help them do even better?”. The buying group that I think does this the best, is your large buyout private equity firms. They don’t come in with any preconceived, egotistical growth strategy. They’re simply looking for attractive companies to buy that then they can leverage their expertise, experience, and influence to help them become even more successful by focusing the on company they acquire. This allows them to then reach their goals of returning their profit to their investors. 3. Lastly, it’s not about the numbers it’s about the people. As I mentioned, I believe companies spend too much time on their financial models. Figuring out how they can they cut costs, or have these grand revenue schemes instead of focusing on the people before the acquisition. I think companies should be spending way more time on the Org Charts, the people and the customers that made the company valuable in the first place. ​Many case studies would say that the acquisition done by Procter and Gamble of Gillette was a great success. This was attributed to their thorough investigation of the people. Many thought that Procter and Gamble being the bigger company that their executive team would stay in place, but actually this was not the case. They took their time and took the best talent from both Procter and Gamble and Gillette and made a best in class leadership team. They also created a culture that had collaboration and best practice sharing. So it really created a best in breed team for the company to grow going forward. ​So, if you don’t have these three foundational value creation rationale; you could have the best integration team in the world and it’s just not going to matter. To me, integration is simply a detailed project plan that outlines how you’re going to achieve your goal, why you did it, what you did and who you’re doing it with? ​As business leaders M&A is all around us in one fashion or another. I’m really curious to see what the studies are going to be like in 2020, 2025 and then again in 2030. Did we learn from our mistakes and improve on all these case studies of historical poor performance? $10 trillion is on the move. I really do hope we’ve learned our lesson. Otherwise companies might as well go to Vegas and put the growth strategy on black. Watch the CFO Ed Talk™or listen to the Podcast Here! Grant has spent the majority of his career working in or advising family-owned businesses. Most recently he was Director for a merger and acquisition advisory firm advising privately-held and family-owned businesses on strategic growth, succession, and exit planning through M&A. Previously Grant spent over 5 years in executive positions with his family’s business, a concrete building products manufacturer and distributor. His tenure included two strategic acquisitions and ultimately leading the process to sell his family’s business. Grant received his B.S. in Financial Economics from the University of Redlands and MBA from the Pamplin School of Business at the University of Portland.